A pair of cardinals is separated and then reunited when their tree home is moved to New York City to serve as the Rockefeller Center Christmas tree. The male cardinal, Red, and his female partner, Lulu, enjoy their home in a huge evergreen tree located in the front yard of a small house in a pleasant neighborhood. When the tree is cut down and hauled away on a truck, Lulu is still inside the tree. Red follows the truck into the city but loses sight of it and gets lost. 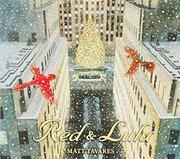 The birds are reunited when Red finds the tree transformed with colored lights and serving as the Christmas tree in a complex of city buildings. When the tree is removed after Christmas, the birds find a new home in a nearby park. Each following Christmas, the pair visit the new tree erected in the same location. Attractive illustrations effectively handle some difficult challenges of dimension and perspective and create a glowing, magical atmosphere for the snowy Christmas trees. The original owners of the tree are a multiracial family with two children; the father is African-American and the mother is white. The family is in the background in the early pages, reappearing again skating on the rink at Rockefeller Center with their tree in the background.